The charitable organization Brands for Canada provides new donated clothing, new personal care items and new housewares to newcomers to Canada. Participating brands across Canada provide the items which are distributed through partner agencies. 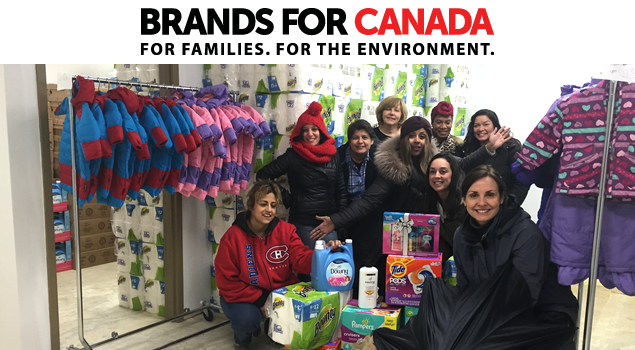 Brands for Canada is proud to partner with Lifeline Syria to provide refugee families with new clothing and personal care items. All goods are new and include a coat or snowsuit, clothing, shampoo, toothpaste and toothbrushes, diapers and household cleaning supplies. Please use this form to access these services. Please visit www.brandsforcanada.com to learn how you can help provide new basic-needs items for the families. You can help with this initiative by donating here.